Mary Moon, Bel-Ray Company, Inc.
Lubricant cleanliness refers to the absence of contamination.1 Microscopic particles are the most harmful form of contamination in lubricants. They can irreversibly damage bearing surfaces, shorten the service life of equipment and cause unexpected breakdowns.1-4 The concentration of particles in new "as supplied" drums of lubricant can differ by as much as a factor of 1,000, and some bulk lubricants may contain even higher concentrations of particles.5 This article looks at how microscopic particles contaminate lubricants and damage machinery, and recommends methods to improve lubricant cleanliness. A particle counter instrument measures the concentration of microscopic particles (p/ml, or particles per milliliter) in a lubricant. The lubricant cleanliness can then be rated according to standard ISO 4406:1999 "Method for coding the level of contamination by solid particles".6 The rating consists of three codes (A/B/C). The first code (A) focuses on the concentration of particles with a diameter of =4 µm (microns, or 10-6 meters). Codes B and C are concentrations of particles with a diameter of =6 µm and =14 µm, respectively. Between 320 and 640 p/ml (particle diameter =4 µm). Between 80 and 160 p/ml (particle diameter =6 µm). Between 20 and 40 p/ml (particle diameter =14 µm). During production of the lubricant, raw materials and manufacturing equipment can introduce particles.1 For example, 22 drums of hydraulic fluids, bearings oils and other products from six major oil companies were analyzed.5 Only three of the 22 (14 percent) drums could have passed a 16/14/12 specification, a reasonable general cleanliness target for oils in service in critical equipment. A typical cleanliness code for new oil is approximately 21/19/16. This can vary due to container type, manufacturing practices and storage conditions. Gaps between bearing surfaces are determined by the design of the equipment and the operating conditions.11 Equipment with tighter tolerances, narrower gaps and faster operating speeds are more susceptible to damage by microscopic particles. Therefore, lubricant cleanliness specifications are lower for hydraulic fluids and compressor lubricants than for gear oils. 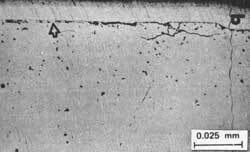 Figure 2 shows an example of a single microscopic particle causing macroscopic damage of a mechanical component. 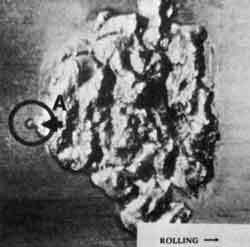 One particle, under pressure inside the bearing, dented and deformed the metal surface on a microscopic scale. When the machine continued to operate, stresses and pressure inside the bearing caused the microscopic dent to grow, and pitting and spalling to occur. Service life of hydraulics with */15/12 hydraulic fluid may be at least 10 times longer than with */26/23 or */24/21 hydraulic fluid with the same formulation. Useful life of a gear with */15/12 gear oil may be 6.5 times longer than if the gear oil is */26/23 due to particle contamination. Cost savings are specific to each application (such as type of equipment and operating conditions). For example, removing microscopic particles and oxidation by-products from compressor oils reduced the energy consumption of rotary screw compressors by 3 percent and extended bearing life by a factor of four.1 Road tests showed that reducing particle contamination in engine oil improved fuel economy by 2 to 3 percent in buses and 5 to 8 percent in automobiles.1 Because processing applications operate continuously, even a 1 percent reduction in energy consumption can be a significant savings. Purchase clean lubricants. The cleanliness of "as supplied" lubricants is typically inconsistent. Bel-Ray No-Tox® Lubricants are manufactured to meet specifications for lubricant cleanliness and SuperClean Bel-Ray No-Tox Lubricants in 55-gallon drums are certified and guaranteed for cleanliness. Bel-Ray's cleanliness specifications are 16/14/12 (hydraulic oils, compressor lubricants) and 18/15/12 (gear oils). Equipment maintenance. Replace worn seals, install desiccant filter breathers on all reservoir openings and vents, and be careful to avoid introducing contaminants during maintenance.22,23 Thoroughly flush gear boxes and bearing housings to remove contaminants before refilling with the lubricant.24 Use vibrational analysis, thermography and other methods to check machinery for misalignment and other conditions that can generate wear particles. It is necessary to add clean lubricants to clean machinery and maintain lubricant cleanliness to have reliable processing operations and long service life of equipment and lubricants. Microscopic particles are the most harmful form of lubricant contamination. They initiate irreversible microscopic damage that grows into macroscopic damage and can disable and destroy bearings, gears, valves and other components. 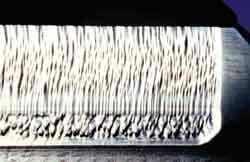 Particle contamination can also shorten the life of a lubricant and increase energy consumption. The appearance of a lubricant is not a reliable indicator of contamination. Microscopic particles are invisible to the human eye. However, particle counter instruments are available to measure the concentration of microscopic particles in the lubricant. "As supplied" lubricants can have various levels of cleanliness. They can range from 16/14/12 (Bel-Ray) to 21/19/16 and higher. Best practices for handling and storing lubricants and managing equipment can protect lubricants from contamination from the environment. Lubricants can be circulated through filters to remove microscopic particles. Particles can initiate damage to equipment before they are removed by filtration. Always start with clean lubricants and machinery to maintain clean lubricants, reliable machinery and efficient operations. Figures 1 and 2 were published in Trends in Food Science and Technology, Vol. 84. Mary Moon, "How Clean Are Your Lubes? ", S74 - S88, Copyright Elsevier, 2007. 1. M. Moon. Trends in Food Science and Technology, Vol. 18, Supplement 1. January 2007, p. S74-S88. J. Fitch. Practicing Oil Analysis magazine. Sept. 2005. Basic Handbook of Lubrication, 2nd Ed. Society of Tribologists and Lubrication Engineers. 2003. L. Leugner. The Practical Handbook of Machinery Lubrication, 3rd Ed. Maintenance Technology International, Ltd.
Noria Corporation. Machinery Lubrication I and II Course Manual. 2004. B. Battat and W. Babcock. APTIAC Quarterly, 7(1). 2003. K. Ludema. Friction, Wear and Lubrication. CRC Press (New York). 1996. B. Johnson. Society of Tribologists and Lubrication Engineers Annual Meeting, Philadelphia, PA. 2007. T. Nash. Hydraulics and Pneumatics. May 2006. L. Badal, J. Whigham and T. Minnick. 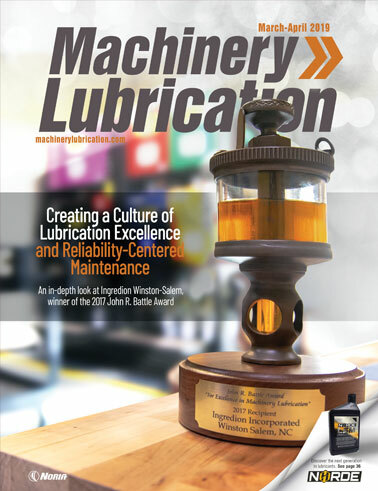 Machinery Lubrication magazine. Sept. 2005. D. Girodin, F. Ville, R. Guers and G. Dudragne. Bearing Steel Technology, ASTM STP 1419. American Society for Testing and Materials, West Conshohocken, PA. 2002. J. Fitch. Reliable Plant magazine. July 2005. A. Mayer. Practicing Oil Analysis magazine. March 2006. J. Evans. Practicing Oil Analysis magazine. July 2004. J. Fitch. Practicing Oil Analysis magazine. July 2002. J. Fitch. Practicing Oil Analysis magazine. Nov. 2002. P. Ramsey. 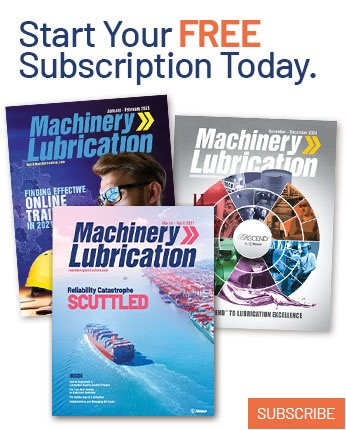 Machinery Lubrication magazine. July 2002. W. Hurley. Noria Learning Center. G. Andrews, M. Li, J. Hall, A. Rahman and S. Saydali. SAE 2000 World Congress (Paper 2000-01-0234). 2000. J. Weiksner and J. Harrelson. Practicing Oil Analysis magazine. Jan. 2004. K. Nicholas, R. Winslow and T. Naman. Practicing Oil Analysis magazine. Nov. 2006. Practicing Oil Analysis magazine. March 2003. K. Nicholas, R. Winslow, and T. Naman. 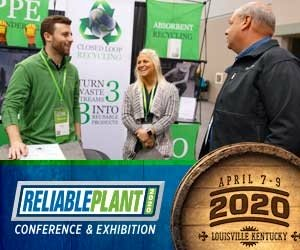 Reliable Plant magazine. Aug. 2006. J. Duchowski and K. Collins. J. Harris and N. Nesland. R. Errichello and J. Muller. Practicing Oil Analysis magazine. July 2002. R. Sales and P. Macpherson. ASTM STP 771, p. 255-274. 1982.